Darcy, who was born with Down Syndrome, has always had a strong sense of what she wants to achieve in this world, one of those things being getting a job. Bubbly, bright and independent with a dream to travel to London and become an actress, Darcy was determined to save some money and put her infectious personality to use in the hospitality sector. Darcy and her family approached WISE Employment Berri to help her secure employment. 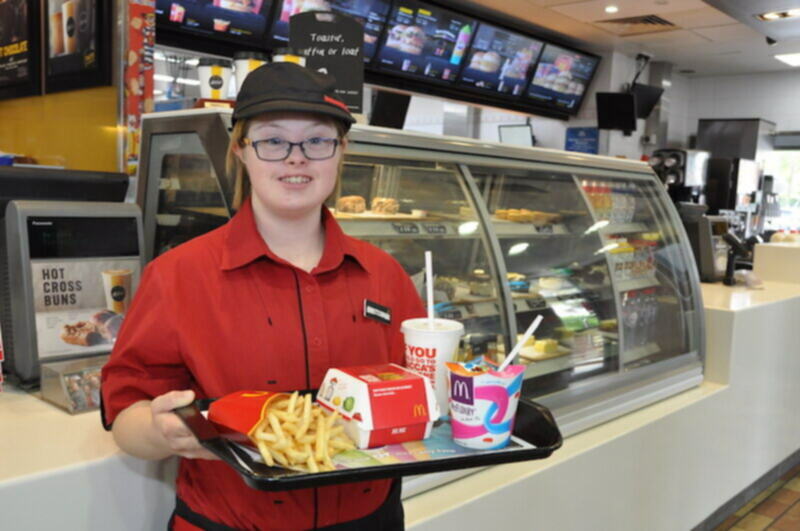 Not long after, she was introduced to Emma, owner of McDonalds Renmark for a potential role. After succeeding in the interview in November last year, Emma created a role for Darcy that would highlight her people skills. “We are so happy with Darcy! She fills the place with her bubbly personality and positivity. The team love working with her and the customers have been really happy,” explained Emma. Since landing the role at McDonalds, Darcy has learnt new skills, met new work colleagues and gained a new kind of independence by having her own commitments. “I love my job! I greet customers, clear tables and carry trays. The worst bit is emptying the bins! I’ve met really nice people and I’ve even made friends with some of the customers,” explained Darcy. WISE Employment has been active throughout the process, ultimately making the role a possibility for Darcy. The WISE team worked closely with Darcy, her family and the McDonalds team to create a sustainable and enjoyable role for her. “Shelley and Venetia at WISE Employment treat everyone with dignity and respect, and Darcy has received wonderful support from Venetia with her role at McDonalds. McDonalds owners and staff have also been extremely flexible, supportive and welcoming to Darcy being part of the Macca’s team,” explained Jane, Darcy’s mum.